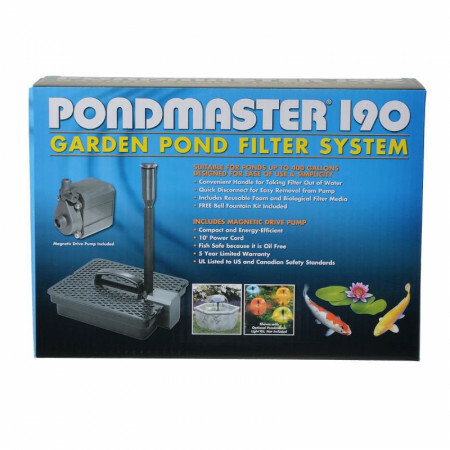 Pondmaster Filter System Kits combine the easy-to-use PondMaster Filter Box with a high-tech fully submersible Mag-Drive water pump. In this submersible pond filter water is drawn into a coarse filter pad to trap debris, then through a finer, carbon-impregnated pad to further purify the water. Filter media is included. A sturdy handle allows filter to be placed where needed and easily removed for cleaning. UL-listed for safety. Includes: Filter Box, Mag Drive Pump, 2 Fountain Heads, Vinyl Tubing, All Fittings, Poly and Carbon Filter Pads. Worked great, really kept my 120 gallon pond clean. Cleaned the filters once a week, same day that I did weekly water change on aquarium inside. Went out this morning to feed the goldfish; water was barely trickling.Cleaned filters, rinsed out fountain tube, ran water through intake valve. Nothing seems clogged; water flows freely. Now pump doesn't work at all. Even checked outlet. Pump doesn't vibrate at all when plugged in; guess it's dead. Sigh; I don't get paid for 3 weeks; so can't buy another. Guess it's bye bye fishies. Would expect this to last more than 2.5 months. This seems to be a great product so far. The price was great, shipping time was quick and it was a breeze putting it together. I've only had it in the pond for a few weeks but the water is still clear. Thank you for a wonderful product. Filter has performed as desired. I think it is a good product. I purchase this product so that I can keep my Koi and Gold Fish in an above ground swimming pool that I am using for them while I fix the leaks of my fish pond. All together there is about 100 plus fish in 1500 gallons of water. I have two of these working to keep water clean and clear until I am able to get pond fix. Even though I have had to clean the filters after 10 days (because of the amount of fish that are in the water) it is doing its job that I knew it would do in keeping the fish alive and water clean and clear. I ordered this pond pump for my 500 gal pond. Great price! And My order got delivered to my house the VERY NEXT DAY!!! Pump is super easy to clean and is doing a great job in my pond. Great price, super fast shipping, nice product... Thank you!!! I'll definitely be shopping here again. I have a 250 gallon pond that the last filter died after a dozen plus years. I searched, read reviews and found this here on Pet Mountain for the best price. Its been almost three weeks and at first I did have to clean the filter 2-3 times a day. Now I haven't had to clean it in a day and a half, the pond is crystal clear, the fish are happy as well as the turtle. I love this filter. Cleaning is easy, and the whole unit makes perfect sense and does a fantastic job. The only hiccup I had, is one day the pretty top insert spout somehow switched its position and emptied the pond. It spurt in four streams instead of the lovely cascade. I stopped it using that day. I'd rather have a clean pond then an empty one. Fish pond is a 500 gallon stock tank, enclosed in cement blocks, with fountains pouring into the tank. Moss was a problem. It took four days of cleaning the filters twice a day to see the bottom. The Pondmaster kit did the job!! I have a small pond about 200 gallons. The Pond filter is perfect for this pond. It is also very energy efficient. The little waterfall effect is also very nice. We bought one of these last year for our turtles. It only lasted not quite a year. We decided to purchase the same one again. Hopefully this one will last longer. This filter is doing a great job of cleaning my murky fish pond. The pond is now clear, but, of course, I have to rinse out the filter daily! WE LOVE THIS PRODUCT WE WERE VERY PLEASED WITH ITS ABILITY TO CLEAN OUT THE ALGEA IN OUR POND. WE WILL SPREAD THE WORD ABOUT THIS PRODUCT. Seems to work very well, as advertised. Easy to assemble, produces nice big bubble effect. Haven't had to clean out the filter after the first week. Has a tendency to tip over in the wind without weighting down the filter assembly at the bottom with a few rocks. The riser is adjustable by cutting to a shorter length. Overall it seems like a good product. Had a pondmaster filter system some time ago and was quite pleased with the performance. Now with a much larger pond I decided to go with pondmaster again and was not at all disappointed. Thanks for a great product and many happy bubbles from the koi!!! This filter is exactly what my pond needed. Very easy to clean and keeps the water clear. My fish love it too....I do recommend this product. Best thing ever. Needed a filter for years! The filter is WONDERFUL. We have had a goldfish pond (outside) for 9 years. All filters were too costly and difficult to use. We always keep the water oxyginated, but scouping out junk, changing water and adding chemicals was quite a chore. This filter is VERY EASY to use. No carbon filters, etc. 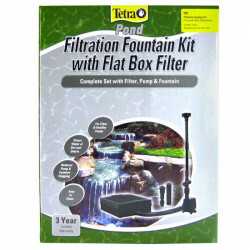 Just a box with pump, two kinds of washable filters and a bell fountain. We changed the filter daily for the first two weeks and could not believe how nasty the water was. The water is clear and I can now see my fish. This filter is remarkable. I talked to a sales associate and she recommended this filter for our pond. It is approx., 90-100 gallons. It takes around 5 minutes to change filters and clean the box (which has a handle fo easy lifting). BEST THINGS ARE: Price, ease of use and helpfullnes of the staff. My husband was not wanting to spend hundreds of dollars for a filtering system that was complicated. Love this filter. Nice little filter system for my 125 gallon pond at an affordable price. Good product, good price, fast delivery plus....it was easy! Could not ask for more really. Thank you! Very easy to assemble. Tried the different spray heads and they all work well. No filter is fun to clean but this one is fairly simple...takes about 5 minutes. Love the fountain effect! fast service! Was disappointed when the motor on this pump only lasted a year. Have purchased this brand in the past and used it continuously for 3 or 4 yrs. Hoping the new one I just bought has a longer life! I love this Pondmaster so much that I have two of them! My pond has two sections and I decided to put the second one in the upper container. I usually run them for about 12 hours a day, seven days a week. One I run with the bell fountain and the other I let "bubble up". They filter out so much gunk and all you have to do is rinse the filters out to clean them. During the winter I ran one 24/7 to keep the water from freezing. My fish "Nemo & Finn" must really like the feeling of the waterfall on their "backs"! They're constantly swimming through it! Two thumbs up from me! 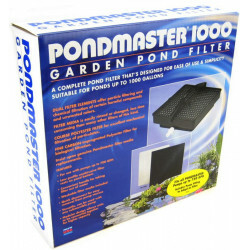 I was very happy with my pond master filter system. Was having a lot of trouble keeping my pond clean, but after I added the new filter system, I went back outside 2 hours later and I could see the bottom of the pond! Very happy! At least I can see my fish now. Quiet, easy to clean works great! Water started out cloudy. Cleaned filter twice a day the first 3 days. Now down to once a day. Soon will be weekly. I am going to add a fine filter to it as I do in my home tanks. We took out our pondless waterfall and replaced it with a fish pond. This was just right and no troubles thus far. 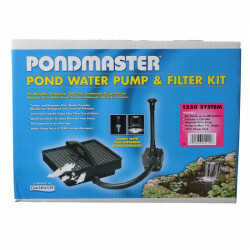 I received my two Pondmaster filter kits and they both work beautifully. With the coupon I was able to use these kits were literally half price as compared to the stores. The kits came on time and were well packaged. Very smooth transaction! 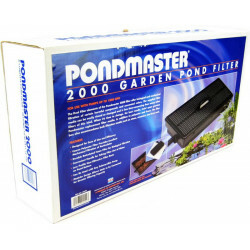 We bought the Pondmaster 1700 It is great! Quiet running. Cleared up the pond in no time. I've been looking for a quality filter that is easy to clean and maintain. This is the best I have ever seen and used! Ease of dis-assembly and cleaning is outstanding. Thank you. Great - I had the same model and ran it 24/7 for over 5 years. I purchased the very same kind because it worked so well the first time - very pleased. I've used the pondmaster filter system for about 2 years in my 300 gal pond. When I first installed I was amazed at the quick results. My pond was finally clear. What an easy, inexpensive system with great results. I run the filtered water through a second smaller UV filter on my waterfall. I clean the pondmaster about once a week. We have had this filter for a couple of weeks now and so far so good. Our water was really bad at first and the filter required cleaning every couple of hours the 1st week. Water is much better now and am only cleaning a couple of times a day. I anticipate getting to weekly or every other week cleanings in the near future. The pump is used for a small (8'x4'x2'deep) outdoor pond populated by fifteen 5-year-old goldfish -- formerly over 25 before the heron arrived. The pump has worked well for several years. The 1 sq ft filter needs frequent cleaning. Now, August, it requires cleaning twice a week. In March-April and Oct-Nov it needs to be cleaned every other week. The water is now sparkling clear. In May-June it was pea soup. this pump and filter system has made my free time FREE. 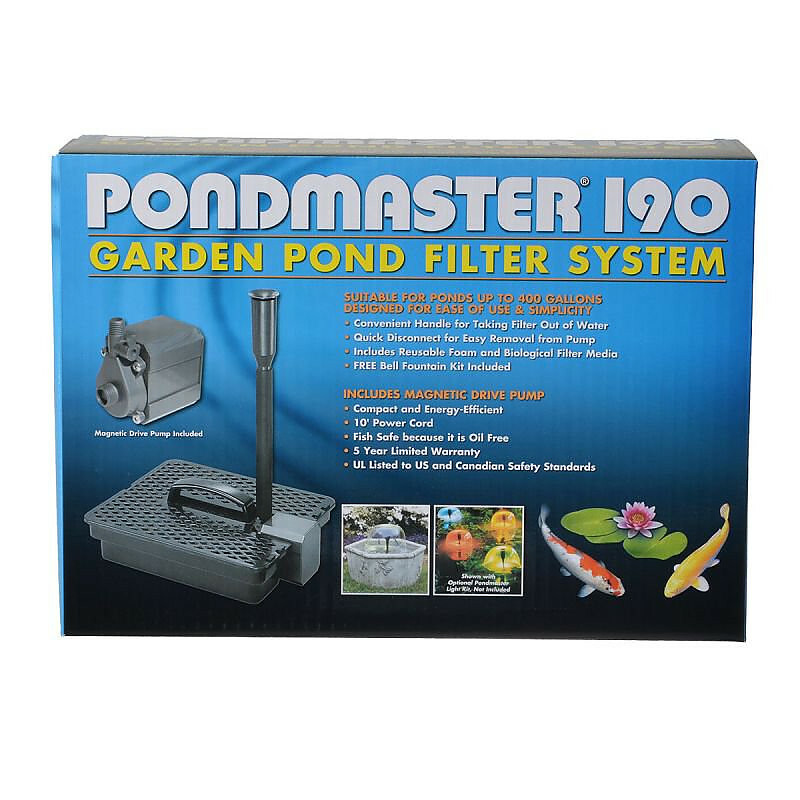 I no longer spend all my free time cleaning the pond because this pondmaster pump/filter does a superior job, now I really do have time off from work that I can call free time because I don't have to spend it all at the pond.